Bali Goa Gajah Temple is a buddhist temple or hermitage for buddhist monk. 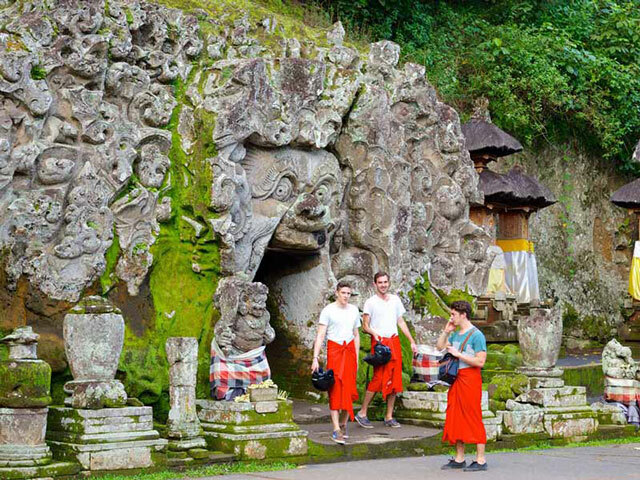 Welcome to Bali Goa Gajah Temple or Elephant Cave Temple which is located in west side of countryside, Blah Batuh Sub district and Gianyar Regency. It is about 27 km from Denpasar town. This cave is built at crevasse edge from the federation of 2 rills that is called Pangkung River , where the irrigation is mixed with Petanu River flow. The federation area of two rivers is called Campuhan/Mixture. 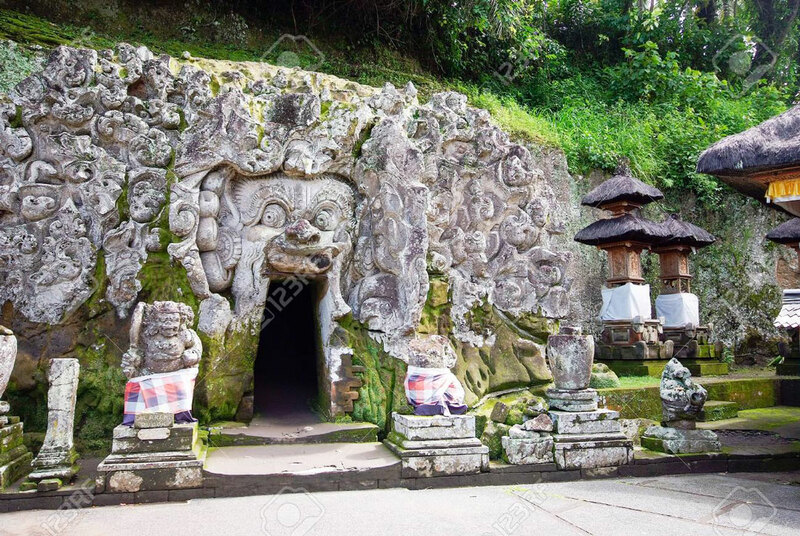 It owns the magical energy on the basis of Rwabineda Concept or two different matters on this basic concept hence Goa Gajah Temple or Elephant Cave Temple is intentionally built among two rivers. The word of Goa Gajah is anticipated coming from the word of Lwa Gajah, the name of Buddhist Temple or hermitage for Buddhist monk. The Goa Gajah's name is written on Negara Kertagama papyrus which is compiled by Mpu Prapanca on 1365 M.
Lwa or Lwah/Loh mean the river and it reflect to the meaning that the hermitage is located at Gajah River or in Air Gajah. In the year inscription 944 Saka, it is mentioned with the name of ‘ser ring Air Gajah' that is meaning the Subak leader in Air Gajah. The word has mentioned that the hermitage of Lwa Gajah is located in Subak Air Gajah. Among the local residents, the Goa Gajah Temple is better known as Cave Temple, located in the west of Bedahulu Village, Blahbatuh Subdistrict, Gianyar Regency. It is about 27 km east of Denpasar. A visit to this temple can be done easily because it is only a few feet below the highway toward the village of Tampaksiring Indeed this temple was built at the valley of Petanu River having beautiful natural panorama. #1. In the northern part of the temple, lies a carved Cave of Nature in the shape of the letter ”T”. Inside this cave there is a Ganesha statue considered as the god of sciences. Additionally, at the location can also be encountered some fragments of statues and a Trilangga surrounded by eight small phallus. #2. In the cave wall, there are niches of the hermitage and the face of Cave is decorated with carvings depicting a jungle with its contents. Similarly, there is a short inscription which reads ”Kumon” and ”Sahywangsa”, which according to the type of letters it is alleged to originate in the eleventh century AD . #3. In front of the cave, except for the guard statues, there are also fragments of building whose origin was unknown such as the building fragments that now being gathered in the temple’s courtyard located in the west of bathing pond. Fountain statues that have worked again in the holy bathing pond are divided into three parts and in terms of its style, they are probably derived from the eleventh century AD. Unfortunately, the statue fountain located in the middle of the pond, has not been found until now. Goa Gajah Temple occur two Buddha statues, one of them is without head while another is still good enough with the style of Central Java. #4. The north side of this statue seemingly stay to stick on the cliffs, where the foot of the cliff temple has long fallen into the creek. #5. On the side of this small can be found three-pronged relief of stupa and the ruins of the cliff temple having beautiful carvings. Based on archeological findings as mentioned above, it can be known the Goa Gajah Temple is derived from the ninth to eleventh centuries AD. In the past, it served as a monastery of Buddhist monk and Shivite priest. This conservatism also shows the unification of Buddhism and Shiva went well. For tourists who would like to visit to Goa Gajah Temple are required to wear a scarf or sarong because other than functioning as archaeological attractions, this temple also poses a sacred place or sanctum. Sarongs and scarves are available at the location. Source: Bali Golden Tour, Bali Guang Ming Tour, Info Wisata Bali.